When Edwin Goffin dispatched in 2003 May his set of occultation predictions for Europe and for the year 2004, immediately the event by 121 HERMIONE of February 16.94 was identified by us as a top level priority at several years scale. - and crossing countries with dense population. - a body observed since this discovery during four more telescope runs at the 8-m VLT and 10-m Keck by a french and american team led by F.Marchis at Berkeley University (USA). The adaptative optics systems of these giant telescopes not only showed the tiny satellite of magnitude 17-18 at 0".3-0".4 of the primary, so permitting differential astrometry of it, but also it partially resolved the elongated central body, which displayed variable rotation phases on successive nights. It resulted that 121 Hermione had become month after month one of the best observed binary asteroids on record ! Near the end of 2003, more and more favourable elements coalesced to build an exceptional occultation opportunity. - First I know very well the french team of the IMCCE, Observatoire de Paris, who observed Hermione and reduced the data : J.Berthier, P.Descamps et D.Hestroffer. We had collaborations with them since some years, especially in the occultation field. They kindly agreed to communicate to me unpublished data and some preliminary conclusions from their image reductions in progress. - Also at the approach of a new Hermione opposition of 2004 January, a new run by F.Marchis et al. had been succesful at Keck telescope on Dec. 06-07, and yet images were arriving at IMCCE. - And fortunately a run with the VLT was planned also, which should end up only 41 days before the coming occultation (!). For all these reasons we got serious hope of applying a reliable extrapolation of the orbital motion up to the occultation date, permiting usable occultation track to be predicted. In 2004 January-February our comprehension of the Hermione system accelerated. - The VLT observation of January 4-6 was successful, yielding more satellite positions. - The AUDE amateur group led by R.Behrend at Geneve Observatory discovered from new CCD light curves the true rotation period : this was 5.551 h, i.e. 3/5 of the previous best candidate period. So Hermione is really a fast spinning body, not very far from centrifuge splitting, or if we prefer, not very far from a situation of close contact binarity. - Freshly reduced Keck images indeed showed a bilobated silhouette (Marchis et al., 2003), that the IMCCE team modelised as "a snowman" : "two connected components of radius 90 and 60 km (a 'snowman' shape) separated by a center-to-center distance of 115 km". They published this new result together with AUDE people in the IAUC 8264 on Jan.09, then they displayed their interpretation of the body rotation as an animated .GIF on the personal web page of F.Marchis. 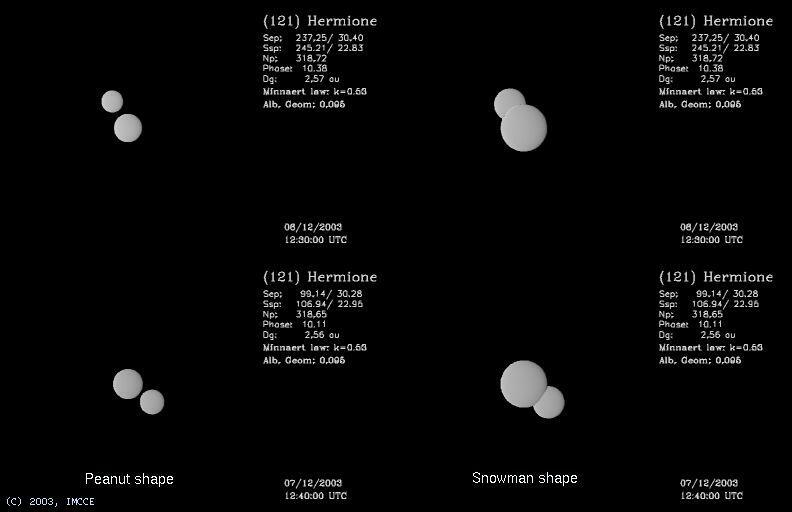 - Soon R.Behrend pointed out that Hermione should reach a minimum of its light curve at the future occultation time, leaving to us limited hope to retrieve from the occultation 'the snowman sihouette' that the Keck images of 2003 Dec. did suggest. Indeed the "snowman" should be tilted with his head in our direction. At this stage a major problem remained : the available observations were a very puzzle, from where no clear solution emerged, neither for the rotation pole of the 265 x 180 x 180 km "snowman" (soon a "rockman", I guess...), nor for the satellite orbital plane and orbital period. Only one thing was sure : as the orbital radius of the satellite was obviously close to 794 km with small uncertainty, and as the Hermione main occultation certainly will follow a centerline from Athens (Greece) to Napoli (Italy), then north slopes of Pyrenees and Bayonne (France), the satellite occultation had to follow a parallel line, somewhere between a northern limit from central Romania to south England, and a southern limit from north of Egypt to south of Portugal. No important mobilization of observers was to be expected upon such a fuzzy basis. After 3 days of paintful calculations, sometimes using semi-graphic methods, I could conclude that two very different solutions were permitted by the data for the satellite orbit, but alas with equal chances 50-50 % : one with a P ~1.6 day period, and another with inversed apparent motion on the sky and a P ~ 2.5 day period. The first one provided a satellite occultation track across Greece, central Italy and south of France. The other one pushed the track very far to the south, across south of Spain and south of Portugal, in rough neighbourhood of the above described southern limit. On February 07, as I was bewailing of the apparent impossibility to prefer one solution (though maybe the first one yielded a smaller scatter...? ), I realized that the IAUC 7980 where Merline et al. had claimed their discovery in fact contained the supplementary information that I needed to reject the P= 2.5 j solution. So finally we had to consider ONLY the Greek-Italo-French occultation path. After that, it was easy to derive accurate P= 1.6273 day period, between 2002 Sep. 28, the discovery epoch, and 2004 Jan. 06, the last known observation. The following stage (the last one) was to estimate the slow precession of the orbital plane of the satellite around the rotation pole of the central body. Such a precession, so-called "nodal precession", is a classical feature of any satellite orbiting a non- spherical primary, by example a primary body with polar flattening. So artificial satellites of Earth on low orbits, with i.e. 1.5 - 2 h sideral period, exhibit node precession at typically 6 deg./day of angular speed. A classical property of node precession is constant inclination of orbital plane about the rotation equator of the primary. Here we expected a constant inclination of the orbital plane of the satellite upon the rotation equator of Hermione. However T.Michalowski of Poznan Observatory, who was working simultaneously on new light curves of Hermione from the AUDE group and also from Pic du Midi, and who confronted them with older data collected in the litterature, had proposed to us some days ago a new possible pole orientation. In theory asteroidal photometry can provide asteroidal rotation axis, when done from several heliocentric directions and properly analyzed. T.Michalowski is an expert in this matter. In spite of that, I used as a first approximation the old pole orientation proposed by G.De Angelis in 1995, that the IMCCE considered previously as the most reliable. Alas the general fit of the satellite positions appeared degraded when I forced the orbit to keep a constant inclination with De Angelis' equator between 2003 January and 2004 January. Then I remarked that another pole, wich was distant by about 50 degrees on the celestial sphere could provide an excellent fit. Then I realized that it almost concided with the new one by Michalowki ! After that, all things fitted nicely. The nodal precession went in inverse sense of the satellite motion, as it is required by celestial mechanics. The precession speed was found ~40 deg./year, a very interessant value that specialists must interpret, as it should contain information about the actual mass distribution within the central body. With a reliable precession model, the final geometry at occultation time was easy to predict. The occultation track derived at last stage was by chance almost identical with the first and provisional one that I had announced some days early, i.e. it passed through central Italy between Roma and Firenze, then through Provence and south of France in direction of the big city of Bordeaux. We issued a new IAUC 8285 on Feb.11 to publish the prediction. The IMCCE team said yesterday that the new rotation pole by Michalowski agrees nicely with all the available imaging of the elongated primary. Now we have to observe the occultation to detect the satellite, though large uncertainty remains. Please remark that my claimed � 75 km lateral uncertainty of the computed path measured on the ground is somewhat... uncertain itself. In fact relative to Hermione the uncertainty of the satellite position is less than the occultation uncertainties claimed by Jan Manek or by Steve Preston. In fact we get the instantaneous radius vector of the satellite with a better accuracy than we can locate Hermione with respect to the star. This paradox... is not a true paradox, as no star is intervening when differential measurements of Hermione and its satellite are made. Finally the � 75 km ground uncertainty that I have proposed in the new IAUC mainly reflects a Manek + Preston combined accuracy. A central question is how much accuracy is improved when we use a mix of Manek's and Preston's results, rather than selecting arbitrarily one of them.